If there is some kind of paradise in Europe, it is Salento in Puglia. 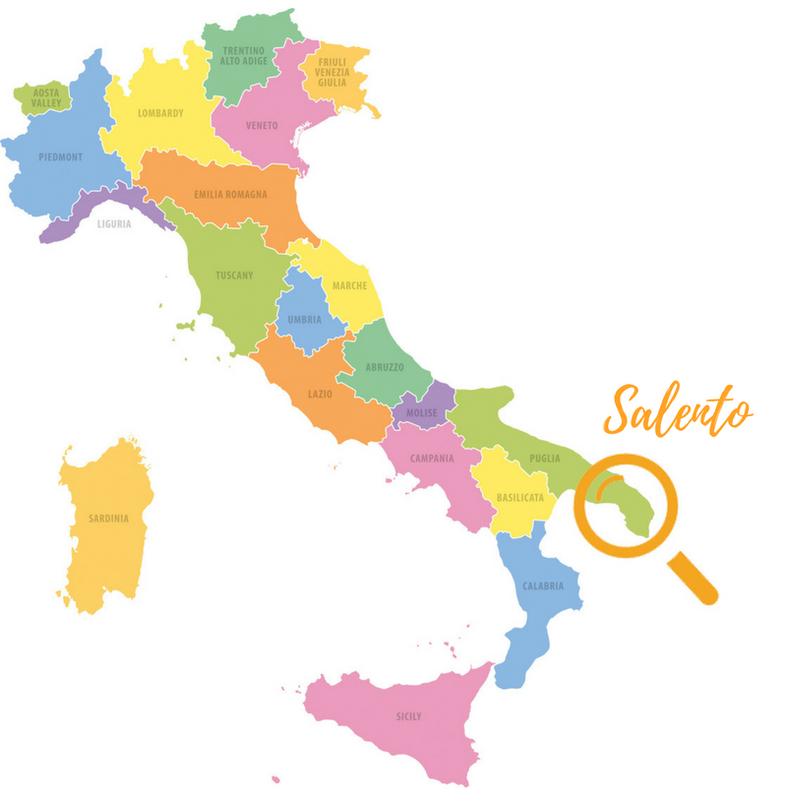 Discover Salento Peninsula with its beautiful beaches, an amazing jagged coastline, marvelous towns with South-Italian flair and the Dolce Vita. Salento is the southern part of Puglia in Italy. The people from Puglia say that they’ve got the most beautiful seascape not only in Italy but all over the Mediterranean. And they’re right: The water is crystal clear, turquoise and you might think you’re in the Caribbean. 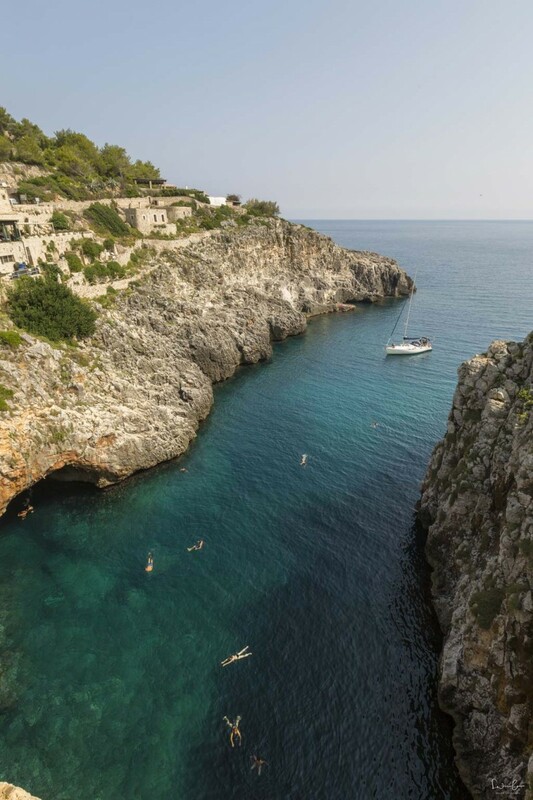 Salento is packed with one spot following the other where you can wrap off your clothes and jump in the water. For me, as a sea- and landscape photo lover, discovering Salento and its photographic hot spots was a dream. The weather was just perfect, the people warm and friendly and the opportunities to explore this part of Italy countless. I was based in Otranto and made my way South to the southmost point of Salento, Leuca. On the coastal route, you will find many lovely towns, beaches, cliffs, caves and restaurants. 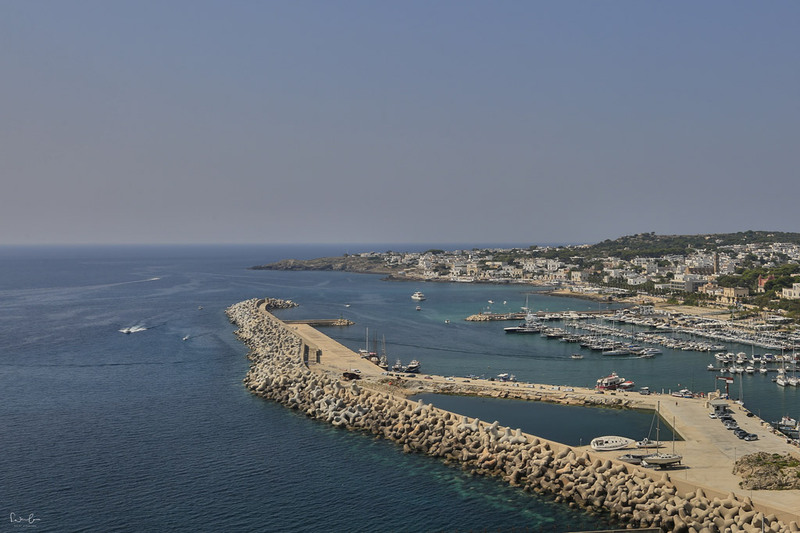 The distance from Otranto to Leuca is only 60 km if you take the beautiful road on the coast. I would recommend to stay in Otranto and do several day trips from there. Salento was part of my 1-week Puglia itinerary and my base was in Otranto from where I started my discovery of the Peninsula. Otranto is a seaside town with nice beaches, wonderful sea-front restaurants and an old town that invites you to wander through the alleys, have a gelato or do some shopping. 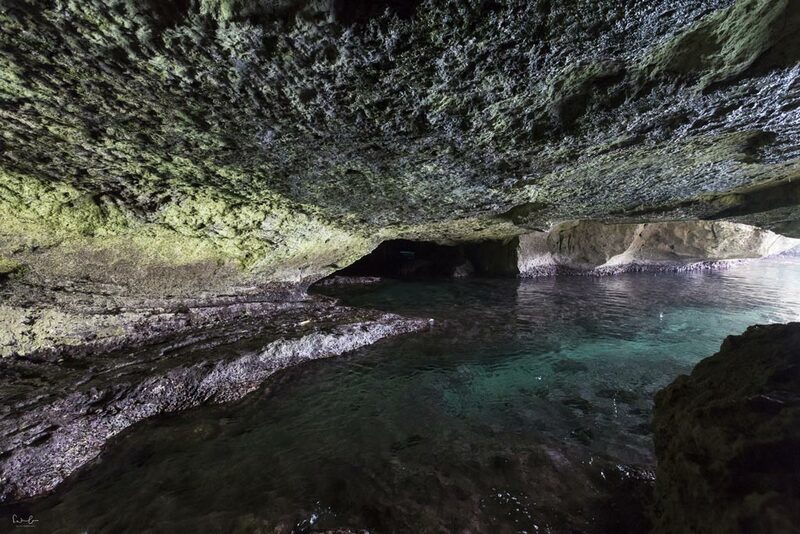 Once you’re in Salento, you just need to discover the countless caves. One of them is Grotta Sfondata, North of Otranto. The best way to explore the caves is by boat. Either you rent one, there are boats you do not need a license for, or you book a boat tour. If you’re into snorkeling, join one of the snorkel groups at the harbor. Near Grotta Sfondata I found the lovely Bed & Breakfast La Zudrea where you can taste and buy delicious olive oil. You can even order from home and get it delivered. Salvatore is a lovely host and happy to receive your order. 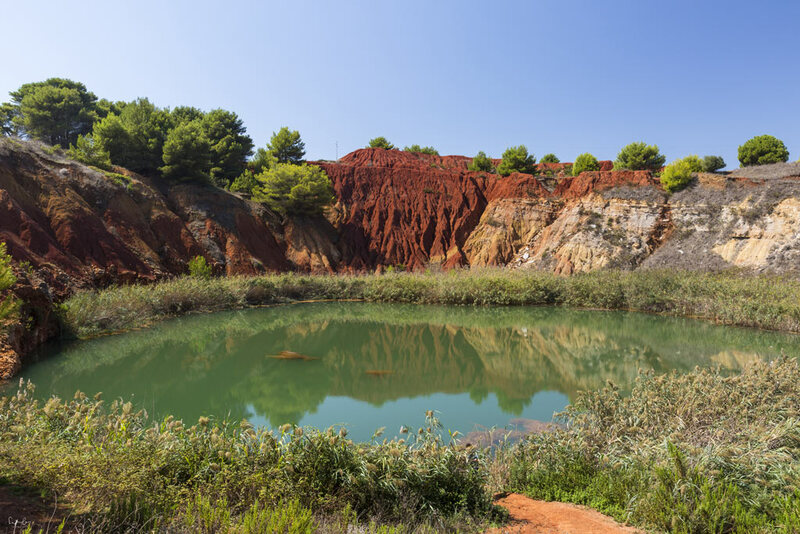 A few minutes away from Otranto you will find a Bauxite lake, an emerald green lake surrounded by red earth. The deposit of bauxite suddenly pops up in the middle of the landscape and is a unique place in Salento. It almost looks like it doesn’t belong to the area. 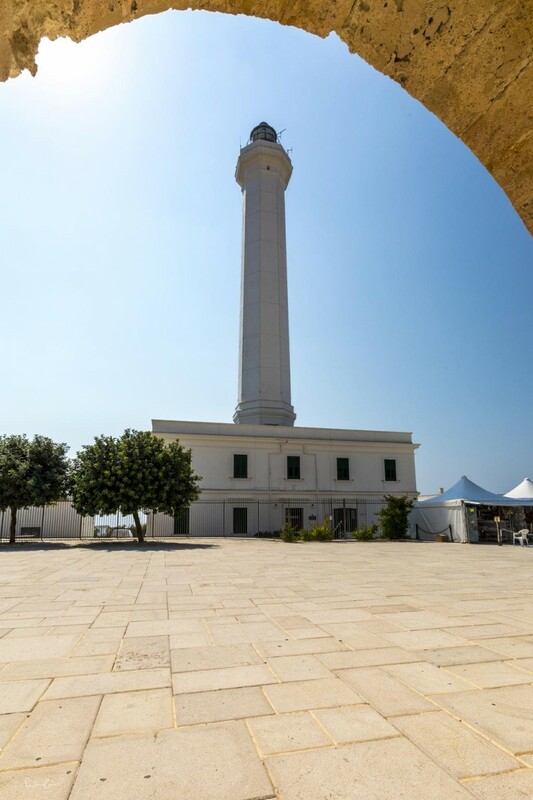 South of Otranto, I recommend you to see the lighthouse of Capo d’Otranto. 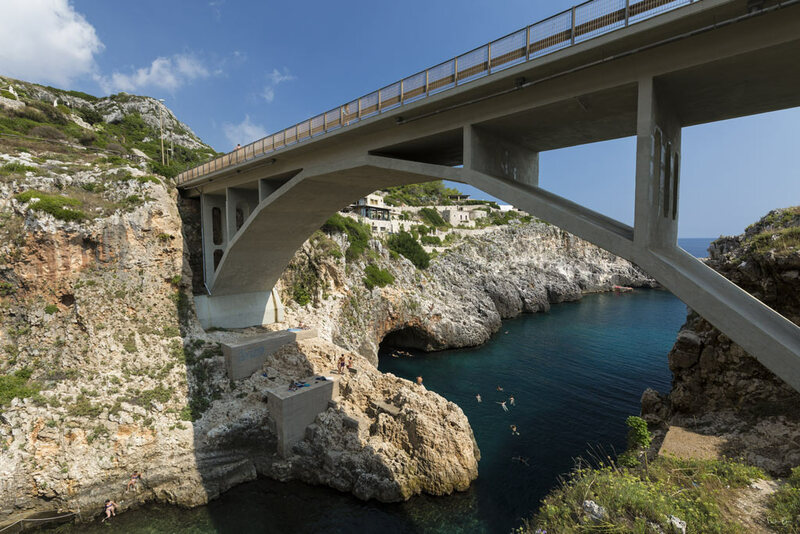 It marks the point where the Adriatic and the Ionian Sea meet. You can spend a few hours sitting on the roof of the building next to the lighthouse and watch the seascape. The scenery is even prettier right before sunset and you won’t have crowds of people there. Heading South all along the coast you will shortly reach Santa Cesarea Terme, a town on a plateau overlooking the sea and famous for its thermal baths. It invites to stop for a stroll through the small town and have a coffee or a snack in one of the sea-front cafés. Palazzo Sticchi, the colorful Moorish villa is the top sight in Santa Cesarea Terme and you can see its glory from far away. Further South (you see it’s all about going South here…) you will pass the famous Grotta Zinzulusa. Honestly, I do not recommend to visit it. You can only enter it with a guide and he seems to be not loving his job very much. The whole tour doesn’t take very long and it’s not spectacular at all. Taking photos is strictly forbidden anyway. 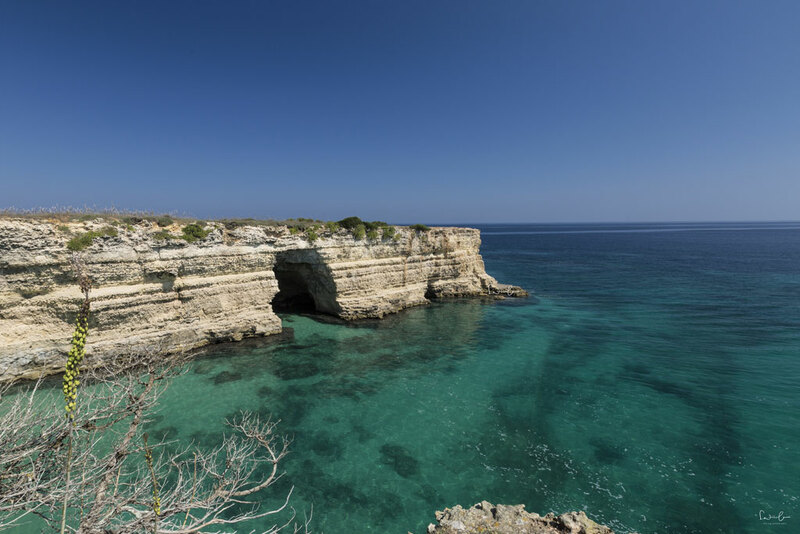 But you can explore Grotta Verde in Marina di Andrano on your own, even without a boat. Make sure you’ve got your bathing suit with you for a swim into the cave. Once you swim inside, you will see the beautiful reflection of the sunlight in the cave. As a solo traveler whose focus is to capture the beauty of traveling, it is difficult to see such places from the inside. I didn’t have a good feeling leaving the camera gear in the car, so, unfortunately, I had to skip this adventure and could only photograph the cave from the point I could walk to. On your way down you should definitely stop at Canale del Ciolo. You will recognize the place immediately by the bridge connecting the rocks. It is a popular place for a sunbath, to swim or to jump off the cliffs. There are very courageous young men jumping from a very high position. Your kind of fun? 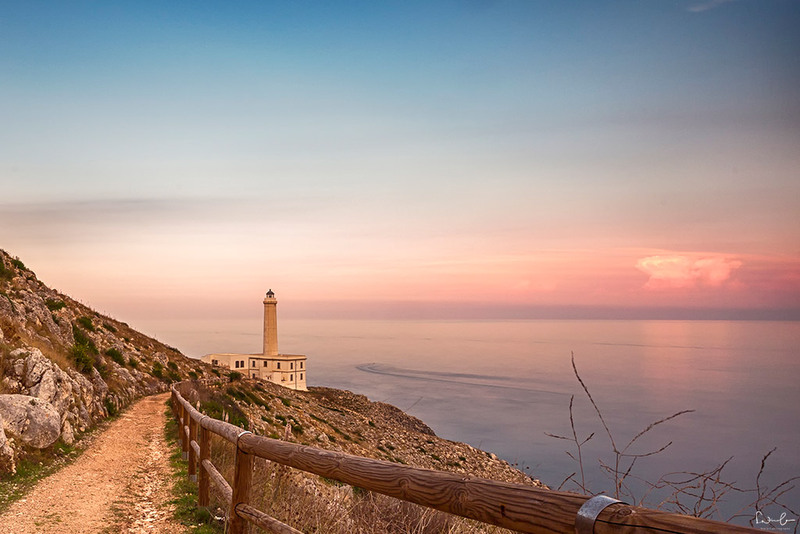 The very south point of Salento is Leuca with its famous landmark, the lighthouse. The sandy beaches make you want to relax and enjoy a beach day, the sea-front restaurants serve delicious food and the town is so quiet and peaceful that you never want to leave again. 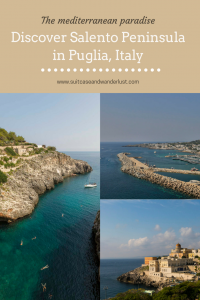 If you’re into photography as much as I am, you might want to check out the 7 awesome photo spots in Puglia. Wow! Your photos are incredible! Salento Peninsula was not previously on my bucket list, but now I really want to visit! I love the idea of checking out those caves too. Awesome dear! You really saw some beautiful places. I was there last year but we went in different locations! Thank you Irene. I saw your post and realize there is so much more to see in this area. Love the pictures. It all looks so peaceful and quiet and this is exactly what I need for a holiday right now. 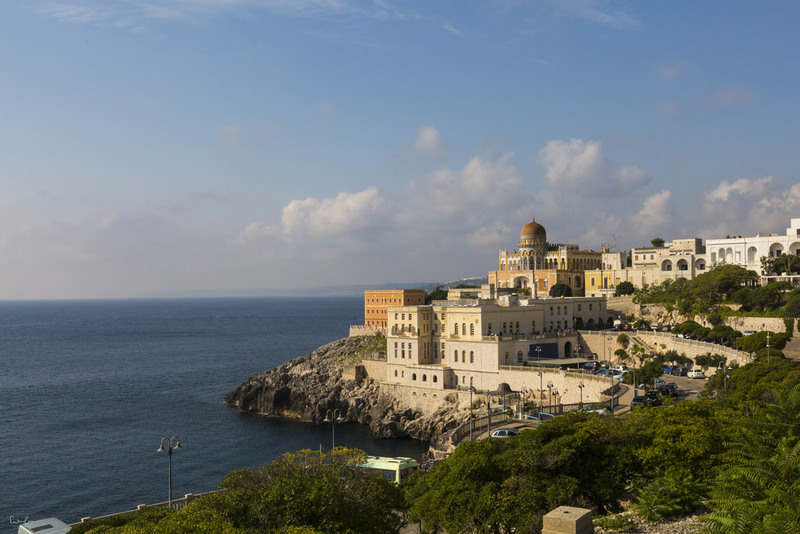 Never been to South of Italy, but maybe it really is time to consider it! I love Italy but I’ve only ever been to Rome, there’s so much more I want to see and Salento is definitely on my list! Beautiful pictures!! 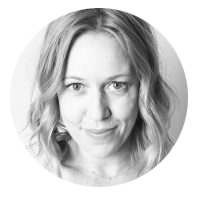 Thank you, Danielle. Rome is beautiful, too. It’s one of my favorite cities in Italy. If you’ve got the chance to go to Salento, you should definitely do it. Whoa! That looks great. You don’t really think about visiting the heel of the boot! How are the crowds there? I haven’t made it that far south in my previous trips to Italy, but looks like I should for the next trip. It looks beautiful. I especially love your sunset shot. I was in the Puglia region this summer but didn’t get to Salento. Looks gorgeous! This looks so pretty! Love the coastline and all the caves. I’ve only been to the western side of Italy, but clearly I need to make it over to the heel sometime soon.